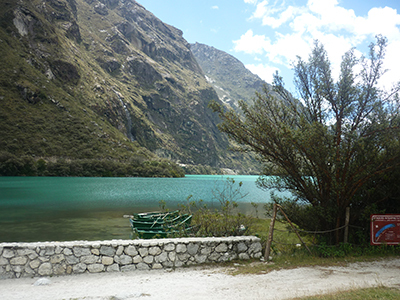 This tour begins at 9:00 am, and is ideal for newcomers to the city of Huaraz. This lake is located north of Huaraz (3100 m) and on the way we will stop to visit the cities in the Callejon de Huaylas: Carhuaz, Yungay, and Caraz. On our first stop we will observe the following mountains: the Huascaran (6768m.snm) the highest mountain of Peru, Huandoy, Chopicalqui, Hualcan, and Cup. Near here reach the village of Anta where we find the only airport in the department of Ancash. This airport was built in 1970 so we could get aid to the victims of the earthquake that year. Our second stop is the province of Carhuaz where we try ice cream and the rich natural fruit of the area. These ice creams are prepared naturally from local ingredients. Our next stop will be old Yungay, a town that was buried by an avalanche of snow from Huascaran in the year of 1970 that killed about twenty thousand people. It is now a cemetery that is very frequently visited by tourists and locals. From here we take a detour to a dirt road from where we observe pictures until we reach the checkpoint of Huascaran National Park where we will register for the entrance of the park. This park was created in 1985 for the conservation of vegetation and wildlife in danger of extinction. 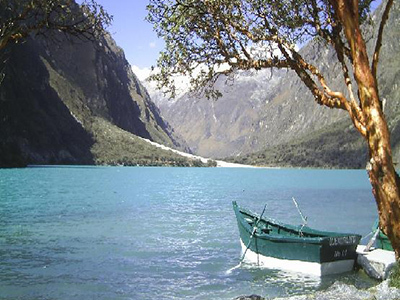 The next destination we see on the tour is the beautiful Llanganuco Lake (3850msnm) with a depth of twenty-eight meters. Our time here will be about one hour. Here we travel leisurely by boat ride, or horseback, etc. Then we depart from Yungay for the last city of the tour, Caraz. Also located in the Huaylas valley, here we enjoy a delicious traditional lunch and sumptuous foods prepared by the locals of Caraz. On our way back to Huaraz we will stop by Tarica where we see the production of crafts in clay and plaster by local artists, then we will return to the city of Huaraz.